The left and middle trays are competitors' worm castings. The right tray is Wiggle Room worm castings. From earlier experiments, we know that worm castings effectively increase the health and growth rate of plants and seedlings. The purpose of this trial was to compare the effectiveness of our Wiggle Room worm castings to other worm castings on the market. In this experiment we filled three trays with 90% soil and 10% castings. In the first (left) and second (middle) trays we used competitors' worm castings and in the third (right) tray we used our Wiggle Room worm castings. All trays we're started at the same time, with the same soil, and using the same number of microgreen seeds. The trays received equal watering regimens and sunlight throughout the trial. The first tray, which contained a competitor's worm castings showed minimal growth and a low germination rate. Stem length and leaf volume were the lowest out of the three. 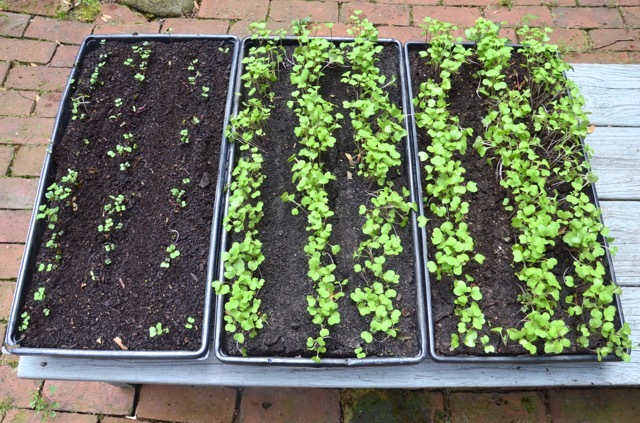 The second tray, which also contained a competitor's worm castings showed more growth and higher germination rate than the first tray but was less than the third tray. Stem length and leaf volume of this tray were in the middle. The third tray, which contained Wiggle Room worm castings had the highest growth and highest germination rate of the three. The Wiggle Room tray also had the longest stem length and largest leaf volume of all the trials. These results mean that Wiggle Room worm castings were the most effective at benefiting plant growth and germination out of the three types of worm castings tested. This is a comparison of stem length between the three trays. A ruler was placed behind a row of each tray to measure the stem lengths (pictured below). The first tray, which contained a competitor's castings, had an average height of around 1 inch. The second tray, which also contained a competitor's castings, had an average height of around 1.5 inches. The third tray, which contained Wiggle Room castings, had an average height of around 2.5 inches. These results show that the Wiggle Room worm castings had the greatest impact on stem height and produced the tallest plants. Stem length of a competitor's castings. Stem length of a competitors' castings. Stem length of Wiggle Room castings. 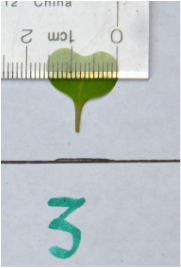 This is a comparison of the average leaf size. A leaf was chosen at random from each tray and measured to determine average leaf size (pictured below). The first tray, which contained a competitor's castings, had an average leaf width of around 1 cm. The second tray, which also contained a competitor's castings, had an average leaf width of around 1.1 cm. The third tray, which contained Wiggle Room castings, had an average leaf width of around 1.5 cm. These results show that Wiggle Room worm castings produce the leaves with the largest width and therefore volume. 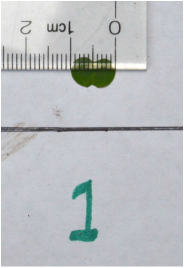 Leaf size of competitor's castings. Leaf size of Wiggle Room castings.